On March 8, 2018, we published that a major algorithm change was on the way (technically that went live March 9 at 12:25AM). The tremors had been felt for days and one of my sources felt it could be days (or months) away. Then on Saturday, March 10, 2018, the Internet was abuzz and site owners all over the world confirmed that a Google algorithm change began taking place March 9, 2018. Google would later state the algorithm change began March 7, 2018, so maybe that was what my source had noticed. As noted in my previous article, the search results were initially impacted in SERPs in other countries outside of the US. One site I track had lost its Rich Snippets (review star ratings) in December 2017 and then lost page 1 positions in search results in mid January. March 11, the rankings AND the snippets came back and then March 12, everything was gone again. (This is indeed a site which should be performing well). March 13th, the rankings and star ratings returned to stay. Several websites which are ranked by spam using PBNs are still ranking wonderfully. In late February I saw content thin websites lose rankings along with other websites targeting medical content. The above 3 observations tells me that this was most likely an update to the way Google evaluates website quality. 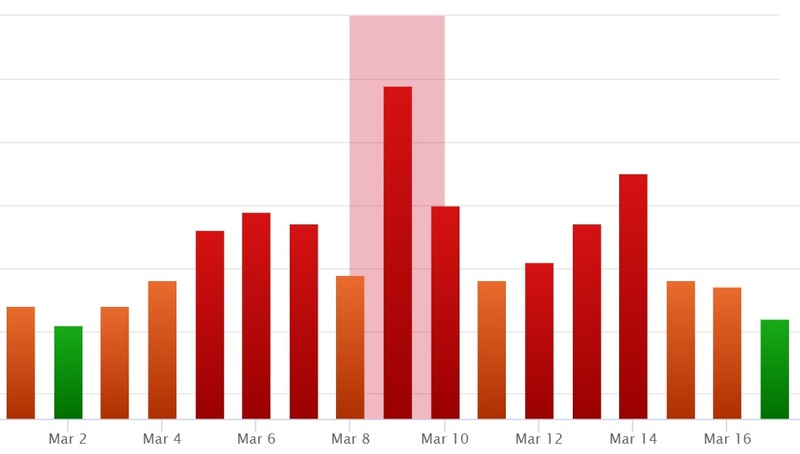 On March 12, Google commented and suggested impacted sites focus on quality content. Then again, Google always suggests this but in reality links are the most important ranking factor. By far. The key dates in this change (so far) were March 8, March 9, March 10, March 11, March 12, March 13, March 14 and March 15. All updates to this will go here. March 13, 2018 update: As predicted above, the algorithm is indeed still rolling out. Today the changes off of a site I was tracking which lost rich snippets and page 1 rankings on March 11, 2018 returned back to page 1 with rich snippets. This change occurred around 10PM Eastern Time. This was a newer client site of mine where I had improved page speed, removed backlinks from low quality web directories and helped them obtain quality backlinks. If the changes remain yet or not remains yet to be seen. March 14, 2018 update: I am still seeing many changes in search results. Today I noticed some sites which had 2 positions on page 1 of Google have lost 1 of the 2 positions. This is a good thing (unless you were listed twice on page one). March 15, 2018 update: I think things are finally settling down today, at least of this morning. Please note this is only based on the sites I personally track. I will post more observations when I have a moment. March 17, 2018 update: Things have definitely cooled off now and I am concluding this article. The website mentioned above is one I recently began working on. As mentioned, in December 2017 their Rich Snippets / review stars disappeared from search results and in January 2018 their ranking mysteriously dropped. Removed Poor backlinks. In this case the site belonged to a law firm. Their previous SEO company had built them dozens of links from random “business directory websites” under the guise of “citation building”. You do not need a million citations for a law firm. I very rarely disavow links but I scrapped all of those crummy links. Obtained quality links. In this case I was able to get the attorneys several amazing links from their BAR association and other organizations they were a part of or sponsored. I figured out a way to get the local city government site to link to them along with the local high schools. All of their important pages were on page 2 and came back to page 1 position 3 which is exactly where they were before they lost rankings a couple of months ago. Of course, they are ecstatic and I am now moving forward with looking at other ways to improve their rankings and crafting content which will bring in more traffic. It’s tough to say which of those three issues was holding them back. Was it one, two or all three things? Google had definitely demoted them in search. I diagnosed this particular website with a quality problem. In their case, their ads were too overbearing. There were too many ads, the ad placement was bad and just everything about the ads was bad. Backlinks and trustworthiness. There is most definitely a trustworthiness factor and Google still relies heavily upon the inbound links and referring domains which a website has as a factor in determining this trust. Website quality. There are so many things Google uses to determine the quality of a website. If they have a problem with a site, the entire domain suffers. Factors here include User Experience factors such as page speed, backlinks a website has, content issues such as thin content, content barriers, obtrusive advertisements and more. This is good news and this is essentially another “Fred” core algorithm style update. Back in the BBS days before there were websites or search engines, people had to evaluate an online service for themselves. Now, with millions of websites popping up every day, search engines must use algorithms to determine a site’s quality as it is in their best interest to send people to websites which best match the intent of their search AND provide a good user experience. It only makes sense to have a nice website which works quickly and properly on every device accessing it. Was your website impacted in March 2018? I have data here on everything from small business sites to websites which get millions of hits per month and enjoy poking around in Analytics. If you would like me to check out your Analytics profile and site please email me. Please feel free to comment below with your observations if your website was affected. As a note I have also seen some sites lose traffic from February 28 – March 1 only to see it return on March 10 – 11. My site always fell between page to page 4 of the search term “penny stocks”. Now, it doesn’t even show up anywhere! And yes, we have done everything asked of us over the years. I did resubmit the site today. The site is still in the search engines but it is not performing very well at all. I am seeing some peculiar links to your site. Please feel free to email me for further information. Thank you. Things were pretty good for our site’s organic rankings with new changes such as meta and SSL but, I saw a ranking drop for most of my keywords whereas organic traffic dropped by around 24% since March 12. Still not sure how to improve this considering Google update does not clearly mention ways to improve SERP. It is tough unless you do it all day every day for people. If I had to sum it all up I would tell people that a quality site with content that comprehensively covers their topic is the foundation and then they need to obtain high quality backlinks. As much as this stuff changes, that strategy has worked great for 20 years and will far into the foreseeable future. This is a great breakdown of the algorithm change. I personally saw the most movement on March 14, and thankfully it was positive. My website is a US based website. Tom, that is excellent. I wonder if you had any quality issues in the past and what you did to correct them and how long the recovery took. I have had success getting results fairly quickly after implementing quality changes, however, it does appear that the big tweaks to the core algorithm dramatically assist sites which have made improvements. Hi Len how long does it take to fix a site which was negatively impacted? That is a good question. Like I mentioned above, if you must wait until the next rollout of an algo change then it could take months. I don’t have an exact time nailed down. However, in the case study in the article, I implemented improvements to a site in January and February and when the March 2018 core algorithm was tweaked the site sprang back to life. So, if improvements were made at least 60 days before an algo tweak you may be in good shape. That said, if the tweak doesn’t occur for 4 or 5 months, you could be stuck waiting. I suspect that in the future many of these quality signals will be baked into the core algo, but we’ll have to wait and see how that plays out. This answer also likely depends on the size of a site. The site I was working on in example #1 above had around 300 pages of content. They do roll these out in various parts of the world on different dates. We were aware of it here on the 7th or earlier. Most US sites were impacted on the 9th – 14th. Hey, Len! Thank you for your sharing. But I have a question. Our French site’s traffic dropped on March.9th (Friday, the daily organic traffic session was 18596), it dropped about 10% than the last day (20366), and the traffic continually went down. March. 16:16929, March. 23:15936. In other words, the traffic dropped about 21%. So we think our site is impacted by this Google algorithm update, but we also found the site’s average rank is getting higher than before in google Search console. So i don’t know whether our site is impacted by google update. Hope you can provide us some suggestion. Thank you very much! Hey Len. We have a newsorthy news site in Greece. We moved to wordpress on August 2017, but we suddenly disappeared from Top Stories on 6th Oct 2017. We never reappeared there, and it seems that the change of March 2018 had no positive impact on our site. However we have already disavowed all the bad backlinks several weeks ago, implemented valid structred data and AMP’s several months ago, moved to https on January 2018, made a really great effort with all of our content (fresh and old content), but with no success. Any idea what in which aspect the new algo change has great impact on? Ok, after doing under 5 seconds of research I can tell you that there are several things going on here. 1. As for Top Stories, you need to read about the Top Stories algorithm change. This is almost definitely your main issue. 2. I visited your site and the site was buried under an intrusive Poker advertisement. That is a huge quality issue. I will be writing a separate post about this soon which will benefit you and I’ll email you when it is done. 3. If you had bad backlinks and just disavowed them, the change isn’t instant. It can take months. Also, this was likely only affecting your organic rankings and was probably unnecessary unless you’ve been blatantly spamming the web. In this case I do not think the algorithm change was to blame, but, I’d have to really dig in. I do work with multiple publishers and could take a look under the hood, but in this case I’d begin with getting rid of the intrusive ad..
hello – thanks for good post 😉 We also were hit by mayby weak UX on web – please I you could look at our site or maybe it is SSL – we buy it 2 weeks ago after hit. Hi Mateusz, if you experienced a drop, the SSL alone will not help. It does appear at first glance to be configured properly. Please feel free to email me. I am looking forward to learning more about trustworthiness and quality. Thanks Len. We noticed an extreme increase in Bounce Traffic on March 22 and 23rd and it has stayed high and consistent ever since. It is on all pages and from all traffic sources. Our traffic is good and still on averaging the same as usual. Our load speed is about the same as it always has been as well. What could this be from? Great! Rankings can change at any moment and do not need an algorithm update for this to happen. It can take time for some sites to perform. Also, if you received any decent backlinks this year they could just now be kicking in. Anyways, nice looking site, keep up the good work! Update: Some sites impacted in March were again impacted in April. You can read about the April 2018 Algorithm Change here. my website traffic has decreased since March, when I started using AdSense in my blog posts. Is that a coincidence, or does Google penalise blogs displaying ads? I don’t think my ads are intrusive, but then again, what counts is Google’s opinion 😉 Many thanks for your insight. They DO indeed demote sites if the ads are “too” intrusive, even AdSense ads. Almost nobody talks about this but it is true and I’ve personally seen it. That said, that does not appear to be what is going on with your site and is likely a coincidence. Or did you remove the ads already? For reference: Google’s Best practices for ad placement. Thanks for your June 2018 update. I too lost rankings and traffic after the March 2018 algorithm change. I have popups and autoplay ads, are those causing the problem? I took some off but the traffic is still down about 30%. Thanks Tom, that is a good question. After everything has been cleaned up you’re still going to need to wait until Google goes through and re-crawls all of those pages and for the next algorithm refresh. IF you have cured the problem(s) your traffic should bounce back. The updates have been occurring monthly, so expect another in July and/or August.